Robot Mode: Let’s start with the resemblance of this figure to its G1 predecessor. Rippersnapper is, of course, a good deal larger than G1 Rippersnapper and far better articulated, but the resemblance is easily apparent and the basic design is very similar, too. So no problem recognizing this guy as a new incarnation of the G1 Terrorcon. Resemblance aside Rippersnapper looks great and has that late 1980s look down pat. I love the design of his head and the color and detail mix also looks pretty good. He has claws on his hands for close quarter combat and carries two rifles on his back, which he can also hold in hand. Additionally he comes with ‘Prime Armor’, actually the fist of his combiner mode, which he can wear as chest armor and house one of the Prime Masters. On some figures that doesn’t look too bad, but Rippersnapper isn’t one of them. Better to leave it aside or put it on his arm as a big fist. Overall I very much like this robot. There is just something about it that screams late 1980s and reminds me of the old Marvel Transformer comics where new characters (really: new toys) just appeared out of nowhere and partook in big fight scenes. So two thumbs up for an excellent robot mode. Alternate Mode: In the late 80s many of the newer Transformers figures had all but abandoned the disguise aspect of being a Transformer (not that disguise ever played that big a role to begin with) and either transformed into sci-fi vehicles or – mostly in the case of the bad guys – into some kind of alien monster. Same with Rippersnapper, who puts on a monster helmet, folds in the legs, unfolds a fin, and basically becomes a sort of shark with arms and legs. The transformation as such is rather minimal, but the result looks pretty cool in a late-80s kind of way. The membered shark monster retains most of Rippersnapper’s articulation and can open its mouth (where you can spot his robot mode eyes looking out). The rifles can remain on the back and the chest armor / combiner fist can also be stored there. Overall a nice monster mode if that is your thing. Combiner Mode: Rippersnapper can transform into either an arm or a leg for a Combiner Wars style combiner. Nominally he is part of Abominus, but can also be used in any other combiner using that design. His chest armor becomes either a fist or the heel of a foot. 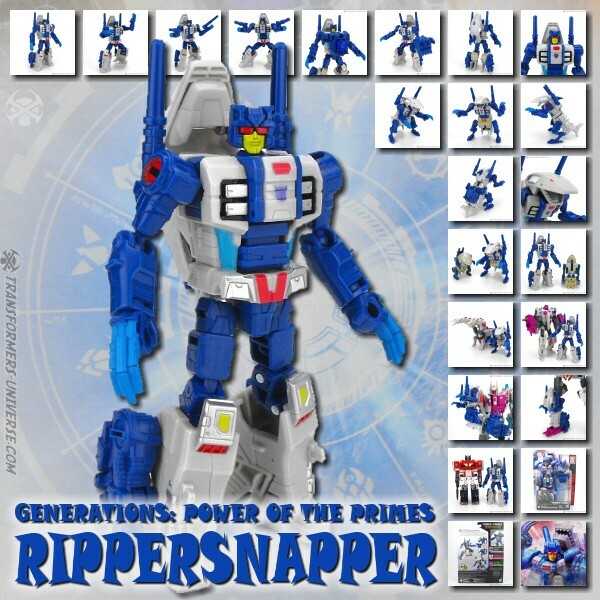 Remarks: Apart from having one of the coolest names in all of Transformers, Rippersnapper suffered the same fate as most members of combiner teams, namely that he is just that. A member of a combiner team. Only hanging out with his team mates, never interacting with others outside of it, and doing little but be part of fight scenes, usually as part of Abominus. As for the toy, though, very nicely done. No flaws, a cool look, and unless Monster-Transformers are simply not your thing, there is no reason not to get this guy. Besides, he is part of Abominus, whom I fully intent to complete. Edited by Philister, 21 May 2018 - 05:42 AM.